This entry was posted in All Ideas and tagged AMBI CVRs GCVRZ probability sale discipline on October 31, 2014 . Disclosure: No position in GCVRZ or AMBI. Thanks to Bing Ma for analytical support. I recently made the tough call to sell a security I think is likely to triple. Contingent value rights (CVRs) are an interesting niche security that can be very difficult to price. When a biotech company is acquired, sometimes the buyer and seller disagree about the value of a particular product candidate, or there may be uncertainty over its eventual approval and commercial potential. In these situations, the acquisition consideration may consist of cash and a CVR, which is a special security that pays a fixed amount of additional compensation in the event pre-determined sales or approval milestones are met. Due to illiquidity, uncertainty, incentive issues, and risk aversion, CVRs sometimes present interesting opportunities for patient value investors. I won’t discuss each of these factors at length, but there are many reasons why a CVR could be mispriced. In some cases, CVRs are not even transferable, offering a speculative opportunity for investors with a long time horizon. One current example is Ambit Biosciences (AMBI), which is the subject of a pending takeover by Daiichi Sankyo. The offer is for $15.00 cash plus a non-tradeable CVR worth $0, $2.25, or $4.50 depending on whether the FDA approves quizartinib and the eventual label. Quizartinib is a treatment for a subtype of acute myeloid leukemia currently in phase 3 trials. Without getting into the merits of the drug and its prospects, the financial calculus is appealing for an investor who believes the drug will eventually be approved. AMBI trades at $15.40 today. That may reflect some degree of merger uncertainty, but assuming the transaction is likely to close, the CVR is being valued at $0.40 today. It could return 5.6x or 11x in ~2 years if the drug is approved. Even discounting back at a high required rate of return, the imputed CVR price implies a very low probability of approval. I would need a more nuanced understanding of quizartinib before committing even a small amount of capital in an all-or-nothing bet, but there is some price below which the AMBI stub would be very hard to resist even without a strong view on the likelihood of approval. Comments from subject matter experts are welcome. But I digress.I recently sold my entire position in GCVRZ. It was a difficult decision and I thought I would try to explain why I thought it was the disciplined thing to do. GCVRZ is the CVR that was created when Sanofi bought Genzyme. At the time, Genzyme had very high hopes for Lemtrada, a treatment for multiple sclerosis (MS) that was previously marketed as an oncologic called Campath. Lemtrada is currently approved in over 40 countries, but in December of last year, the FDA rejected the drug for MS in the United States. The price has rebounded over the course of 2014 as the FDA unexpectedly allowed Sanofi to resubmit its application, rather than appeal the decision. Many investors are speculating that the FDA will bow to political pressure and reverse course to approve the drug, and recent trading may reflect increased speculation as the decision nears. More on this in a moment. The details of the Lemtrada CVR are a bit involved and several of the potential payments are already moot (including a $1 payment had the FDA approved Lemtrada before March 31, 2014), but there remain a few rays of hope. The CVR will return $2 if Lemtrada reaches $400 million in global sales over a specified time frame. There are also several large additional potential payments if Lemtrada becomes a blockbuster, with worldwide sales of $1.8 billion or more. Given Lemtrada’s status as a second-line therapy and the increasing competitive environment for MS treatments, most observers believe the larger milestones are extremely unlikely. I agree and think GCVRZ will ultimately be worth either $2 or zero. I first grew interested in GCVRZ in early 2014, but not because of any potential for FDA reconsideration. By my calculations, it should have been possible for Lemtrada to achieve the $400 million sales milestone irrespective of US approval. (The US is the largest potential market). This possibility seemed under-appreciated by the market and was the primary basis for my investment. Examining the relapsing MS patient population, country-by-country, and making relatively conservative market share assumptions, the sales milestone seemed achievable. I won’t rehash the details, but the numbers could work because Lemtrada is a very expensive drug and the potential market is very large. I estimated that $400 million in sales would represent less than 20% of the addressable non-US second-line relapsing MS market. News of the resubmission was a nice bonus, but as long as I felt there was a strong possibility of meeting the milestone even without US approval, I was mostly indifferent to the trading price of the CVR. Unfortunately, I failed to account for an unexpectedly slow commercial launch. Sales in Lemtrada’s first few markets have been disappointing, and they cast serious doubt on my hypothesis. I no longer believe that the $400 million sales milestone is achievable without US approval. For example, I initially attributed slow uptake in Germany to a lack of reimbursement, but sales actually declined quarter-on-quarter in Q3 even after some of the reimbursement challenges were resolved. Initial UK sales were anemic, and they start the clock on the milestone calculation next quarter, evidently before the drug has achieved widespread acceptance. It appears doctors are (reasonably) being somewhat conservative about prescribing a new therapy. It is possible Lemtrada will eventually see broader usage, but initial indications of the speed of commercial adoption are not positive. Non-major markets are currently at an $18 million annual run-rate 3-6 months after launch. The milestone must be achieved during the first year of sales for each major market plus the period Q2 2015-Q1 2016 for all others. In short, while Lemtrada may someday be a $400 million/year drug, I don’t see it happening right off the bat. Frankly, if US sales follow a similar trajectory there is risk to the milestone payment even with US approval. So, here I am publicly declaring that I sold GCVRZ about a month before an FDA determination that could cause it to double or triple. Won’t it be embarrassing if the FDA approves Lemtrada? Not at all. In fact, my best guess read of the tea leaves is that Lemtrada will ultimately be approved. I just don’t want to bet on it! If Lemtrada is not approved, my analysis suggests the CVR will be worthless. It might retain some option value on the open market, but it would result in a permanent capital impairment. If Lemtrada is approved, I expect it would trade at a modest discount to the $2 milestone payment to account for time value and the chance of a weak US launch. Assuming downside of perhaps $0.50 and upside of maybe $1.00, the risk/reward trade-off of 2:1 from $0.60 appears attractive at first glance. Tempting as that gamble may be, however, I owned GCVRZ because I believed it could be worth $2 irrespective of approval. I no longer believe that to be true, so I sold it. I won’t go into detail on the various arguments for and against approval. There is an interesting scientific debate on the role of blinding in the phase 3 study for those who are interested, but my personal opinion on the statistics is ultimately irrelevant. The FDA is a political institution and its decisions are historically very difficult to predict. It seems hard to imagine the agency allowing a resubmission without at least some desire to reconsider, but they have rejected resubmissions before. Some proponents look to WMGIZ, another CVR representing a medical device that recently was approved after a similar reconsideration process, as evidence that Lemtrada will be approved. Unfortunately, this logic is not sound. Medical device reviews are conducted by a different part of the agency, and more importantly each individual approval decision is made independently. There is no reason to think that an MS treatment’s approval odds are in any way affected by a bone graft approval. What to make of the odds of approval then? I see a lot of investors make simplistic expected value arguments that start by assuming approval has a probability distribution. This is wrong. When we talk about likelihood of an event that cannot be repeated and cannot have multiple outcomes, we use the language of probability subjectively. But there is no distribution of outcomes because there is only the one binary yes or no. The FDA will either approve Lemtrada or it will not. At best, we can draw analogies to other FDA decisions and try to make the simplifying assumption that multiple independent approval decisions add up to some sort of distribution of decisions, but I’m not sure this is helpful. If the FDA approves a certain percentage of phase 3 products, that does not provide very much information about the chances of any specific product candidate since each is considered on its merits. This is a problem that is traditionally solved through position sizing; if one could construct a portfolio of dozens of CVRs or biotech stocks at appealing odds, perhaps the overall return would justify the risks. However, with a limited number of potential investments and unique circumstances to each, results are likely to be path-dependent. Without robust probability estimates, we can’t use the Kelly criterion effectively, and the best course of action comes back to analyzing each situation individually. (For this reason, I generally invest in biotech stocks only when I believe I am getting the pipeline for free or I have a strongly differentiated viewpoint on the likelihood of eventual drug approval). I think it is a mistake to try to calculate expected values to price a CVR. I’ve seen a number of investment theses that say approval is a toss-up and assign 50% probability to approval, then calculate expected value. Bloomberg even has a tool for doing this with GCVRZ. If you accept the roughly 2:1 odds I computed above and a 50% probability of success, the Kelly criterion would suggest allocating 25% of your portfolio to GCVRZ. Suddenly, that 50% probability estimate doesn’t seem so robust, does it? At a subjective probability below 33%, Kelly suggests not investing at all. Yet how can we reasonably discriminate between 33% and 50% odds of Lemtrada approval? For good measure, investors will sometimes boost their price targets by assigning an arbitrary probability to the very unlikely milestone payments. 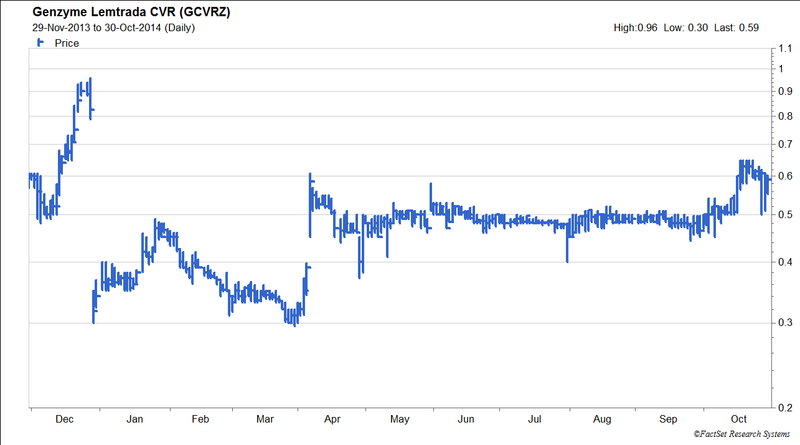 GCVRZ pays $4 for $1.8 billion in annual sales—it makes a huge difference in an arbitrary valuation calculation if you assign that unlikely event 10% probability ($0.40 expected value) or 1% probability ($0.04 expected value). Yet 10% is a common subjective probability assigned to unlikely events. It doesn’t actually mean that if you could run 10 trials, 1 of them would result in the outcome. We don’t have enough information to say. While we do this colloquially all the time, it can dramatically skew a valuation exercise. A more effective way to put it as an investor is to ask: what would I be willing to pay for this unlikely event? Based on my understanding of the MS market, I would not be willing to invest more than a de minimis amount as I suspect the true chances are closer to 1% than 10%, speaking subjectively. The “right” expected value may be $0.04; it may be $0.40, but it doesn’t matter. Investors are not necessarily risk-neutral when there is no possibility of arbitrage. My point here is not to argue that there is no price at which the odds would be compelling enough to justify the risk. Only that there is not enough data to assign a meaningful subjective probability. If GCVRZ trades below $0.50 before the decision again, perhaps I will take a flyer with a small position. Otherwise, I am satisfied to have profited from others’ subjective reduction in discount rates or increase in probability estimates. I notice that I’ve started to ramble a bit, which is perhaps indicative of my ambivalence about GCVRZ. It is trading somewhere close to where I feel the risk/reward of FDA approval is fairly valued, perhaps a bit too optimistic. The security is in any case very clearly being treated as a bet on approval, given the sales trajectory so far. I no longer believe I have any analytical or informational advantage, and my first priority is to protect capital. My thesis changed, so I will leave it to others to underwrite event risk into which I have no insight.